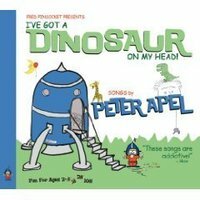 Little Zombies: I've Got a Dinosaur On My Head: We don't just do books! I've Got a Dinosaur On My Head: We don't just do books! I decided to add this CD in with the blog. After all, zombies can like music too. And when it's difficult finding good/fun music for kids to listen to and something that will entertain you too, we can always use the help. We picked this up from the library. And I love it. They're mostly silly songs. Well okay, they have Twinkle Twinkle Little Star....including.... Christopher?? Your kids will giggle. Maybe you'll start singing along too. Some of the song titles: I've Got a Dinosaur On My Head, I Love Bananas, and I Eat Oatmeal For Breakfast. Though you can skip the Train Whistles....as it's just trains chugging along. No words if I can remember. You can find it on iTunes or Amazon , which has it for $1 cheaper. Even the husband seems to like it. He's making his own words to the music.